Log Dollhouse. The best home away from home there is. Log Dollhouse. A Project worth Relaxing With. You start your morning with your favorite cup of coffee, either flavored or non flavored, you choose. You then head outside onto a quiet porch overlooking a beautiful lake. It's breath taking. You stop to sit and drink in all that you see. You see absolutely nothing but trees and water. No one stirring. You're miles from anyone. The only sound is the occasional coo of a bird in the distance. Even in Mini the Above scene is Amazing! The cabin to the left looks just like the scene we described. Best news, it's a miniature! Your imagination is the only limit that you have as you create this miniature masterpiece. It is a quick build so it is super easy to construct. It's one of those dollhouses that you get to decorate without requiring you put your time and efforts into design construction. 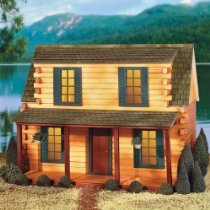 This Log Dollhouse can be found here. Also look in the product box below on page 2. Your Log Doll House Project. As you set up this model, the beginning is the most appropriate time to start thinking about furniture, decorations, accessories and anything else that will complete your project. After all you will not want to start something and not aim at its total created state. Being a thinker when you commence a project is one of the biggest assets you have. No question is unnecessary if you truly do not know the answer. Good research as well as asking the proper people will usually yield the answer to most of your questions. Definitely look around your own home environment to help decide about what you will need with any current miniature project. Seeing what you possess in real life will help you develop great designs for your minis. If something you see is interesting then make solid plans to create it, purchase it or add to a current style to accomplish the design. Get started in the right direction for choosing furniture pieces here. Check out this information found here concerning the below search box. It will help you in searching effectively for a product you are interested in.